Donating your old vehicle to Goodwill® can help someone in your community get back on their feet. 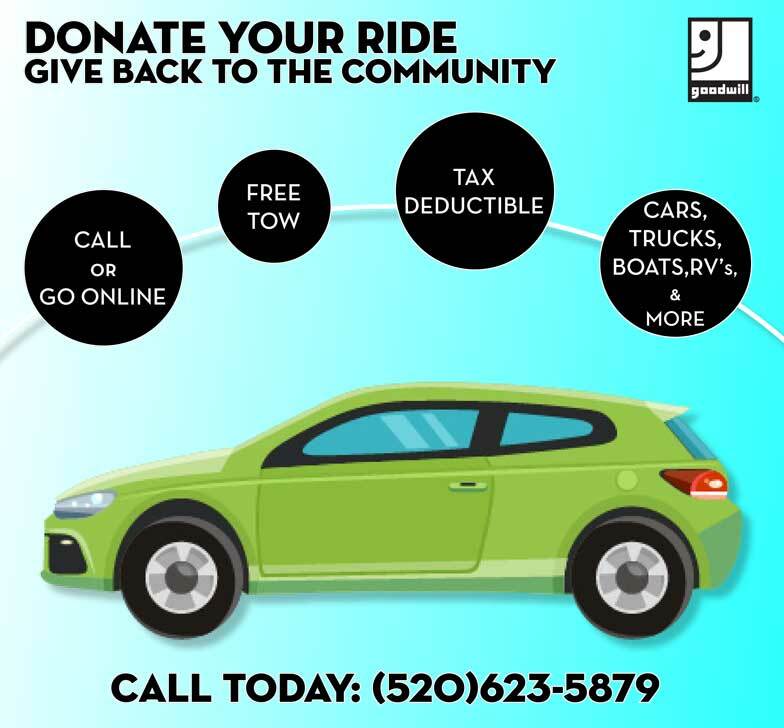 Donate your unwanted car, motorcycle, RV, or boat to Goodwill® and the net proceeds from your donation will help us fund the employment programs and services we make available to the community. This means that YOU not only receive a tax deduction, but you also help support free job training workshops and job search services, youth mentoring, case management and more! When you make a vehicle donation, you put those wheels to work! We also offer towing AT NO COST TO YOU! The Donation Process is Quick and Easy! You must have a clear title. Complete the online form below or print out the Car Donation Form and email us at transport@goodwilltucson.org or bring it in person. *Vehicle donations cannot be accepted at any of our retail locations. If the vehicle doesn’t run – we can tow it at no cost to you! Once your vehicle is sold we will mail you a donation receipt and a 1098-C for vehicles sold over $500. Please tell us where to pick-up your donation. Do you need a FREE complimentary tow to Goodwill? If "No" we will need a lien release. How did you hear about our vehicle donation program? Current inventory of vehicles for sale. Our Car Sales lot is located at 1770 S. Cherrybell Stravenue, Tucson, AZ 85713. Vehicle inventory change often. Last year, thanks to your donations we were able to keep over 28.5 Million pounds out of local landfills. Let's keep that number growing.